This is the fun part! 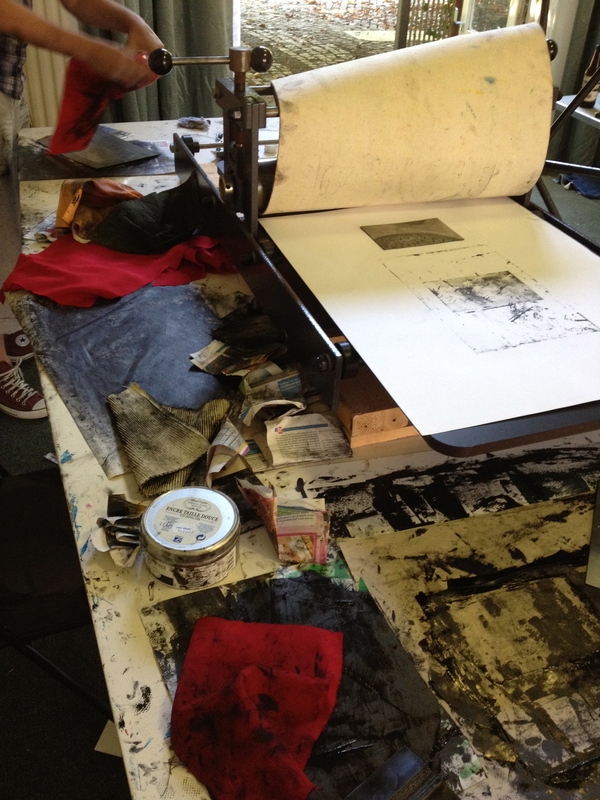 There’s filing and polishing and cleaning and grounding and etching and cleaning and wetting paper and inking and whiping the ink of the plate and cleaning again and finally pressing the inked plate into the wet paper. And it’s a surprise what comes rolling out every time. 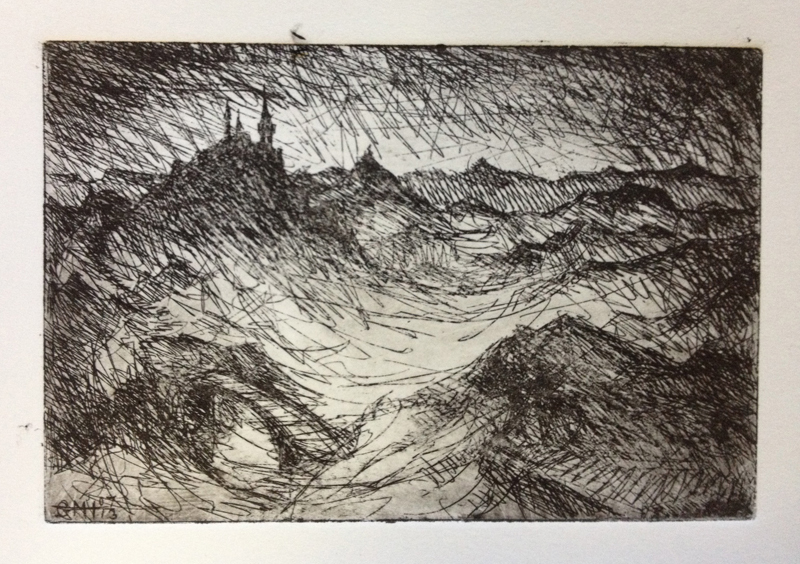 Those little steps in the etching process all potentially have a big influence on how the illustration tuns out. And last week we haven’t quite managed to master all steps yet. But that’s part of the fun (as long as you know you still have a few more days in the studio left). 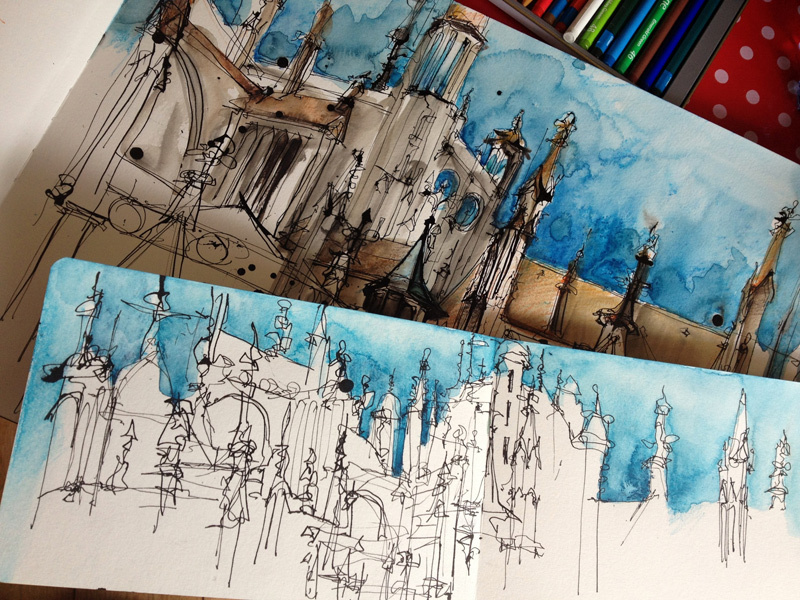 It’s such a lovely analog and traditional way of making art. I love it! Wow! 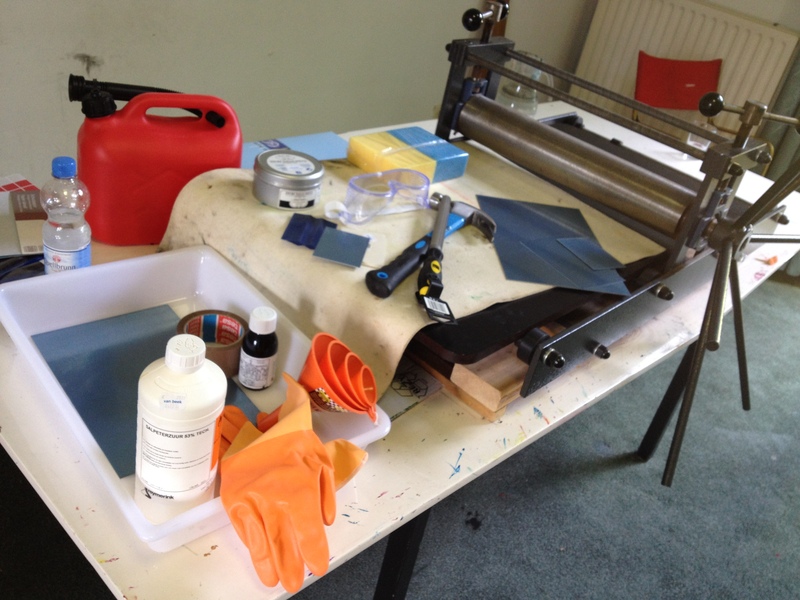 It has been quite an adventure getting all the chemicals and materials for the etching studio. 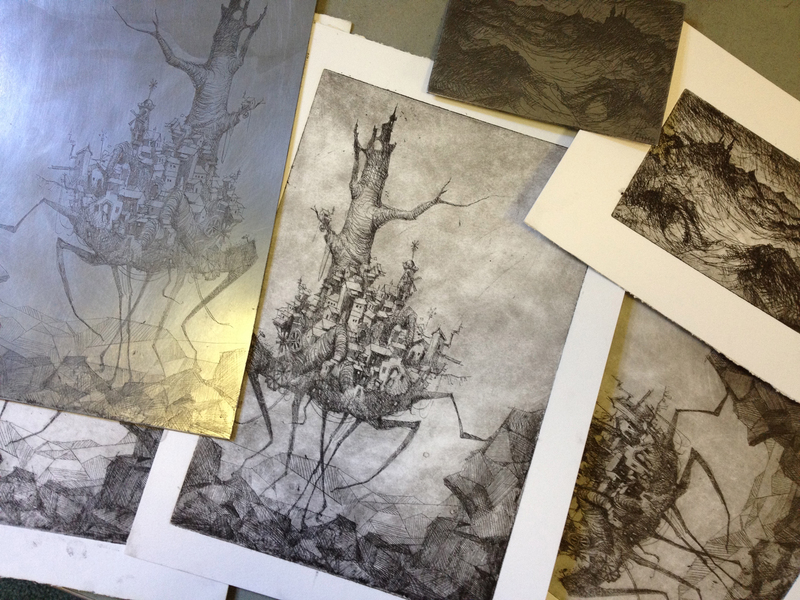 It seems not one art store has all the stuff needed for the etching process. A lot of times they don’t even know where to get things like nitric acid-proof containers or what kind of alternatives to use. We spent a full 6 hours touring the cities of Tilburg and Eindhoven and studying the chemistry of plastics and acids along the way. The best tip we got was from a friendly art store owner who told us to buy a plastic industrial preparation dish for meat because of its high density and good nitric acid resistance! Finally we managed to mcgyver all the equipment and chemicals together, felt like a proper Breaking Bad episode. After 3 months of battling many a digital deadline, it is finally time for some good old dirty hands illustration making! 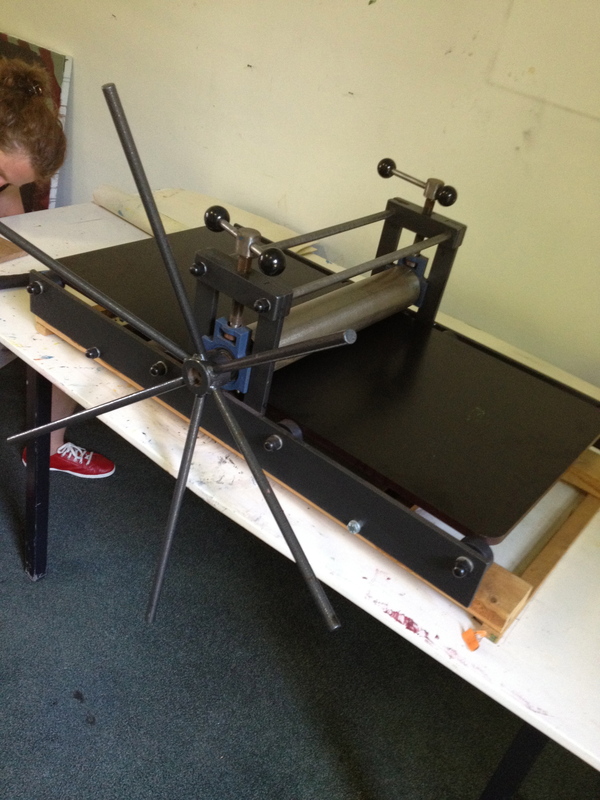 It had been over 5 years since I last used my large size etching press, but yesterday I finally put it back to use! It was quite a kerfuffle getting the 100 kg press down 2 wet sets of stairs and into the back of Annekes VW Lupo. Day one has been all about cleaning the press, putting it back together and running a few tests. Tomorrow the game is on! 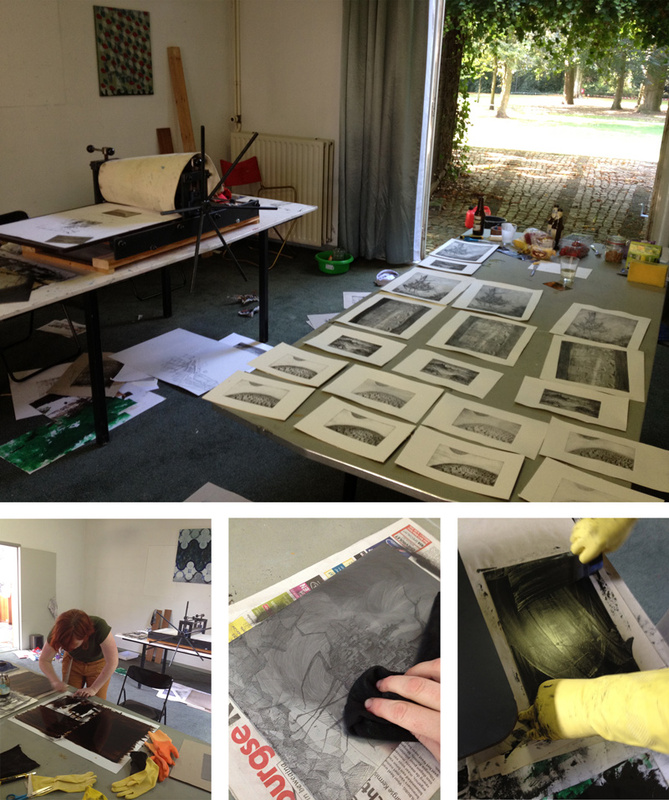 Had a lovely day drawing and painting with Anneke and other friends in Den Bosch yesterday. Under the influence of the famous ‘Bossche Bollen‘ and a few ‘Kollekes‘ we spent most of the day around the St. John’s Cathedral, amazing ourselves about the numerous pinnacles and wondering wether the architects drew up the whole design beforehand or if perhaps they used more of a on-the-fly method of building. Last sunday I went on a sketching trip to the former Philips area in Eindhoven with Anneke Vervoort. After a good warming up that included hot chocolate with a big scoop of cream and a few pieces of pie, we went on to the former Machine Room and got out our sketching gear. This hall is definitely still one of my favorite industrial buildings I’ve visited. The roof is stunning, but above all I love all the pieces of machinery and the tear and wear that’s still present on the floor and walls. Unfortunately one of the big steam driven turbines that used to be an important part of this hall is now left outside to rust. The hall now houses a restaurant, so make sure you go out for dinner here next time you’re around! After a startup period of almost 3 years I decided it is now time for a decent portfolio website that includes a blog! It is now live and I’ll spend the next few days optimizing it. 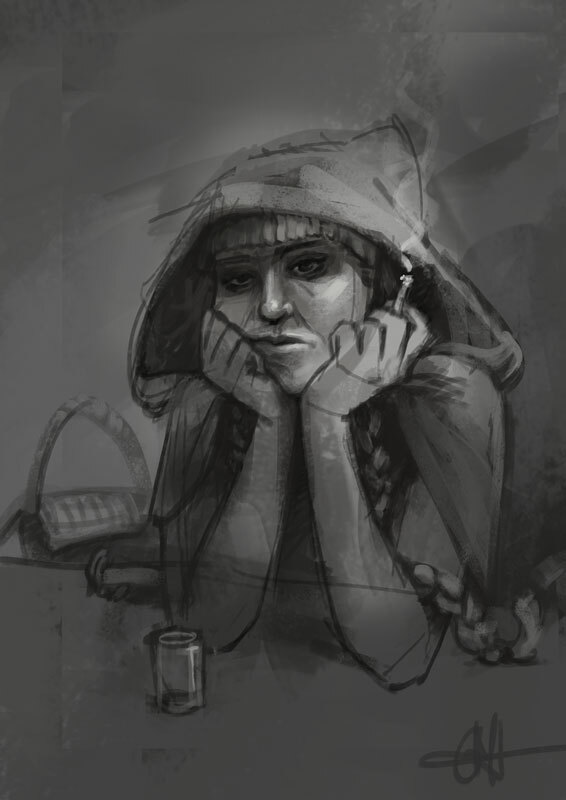 Also working on expanding my illustration portfolio with personal art. Very excited indeed!